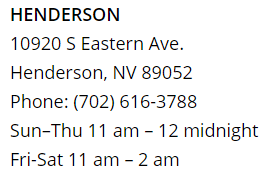 Whether you’re new to Las Vegas or a long-time resident, you owe it to yourself to check out the best sushi in Las Vegas. 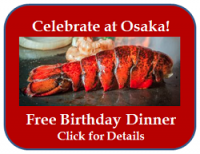 Osaka Japanese Bistro is a family owned and operated business that has given generations of Americans their first taste of traditional, richly flavored Japanese cuisine. Guy Fieri and the Food Network Agree! 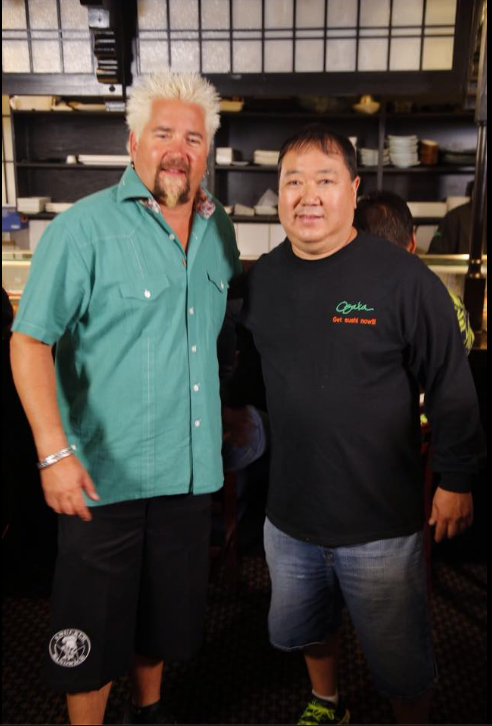 We were thrilled to get a visit from the Food Network’s restaurant reviewing road warrior, Guy Fieri. He spend some time in the kitchen to see our sushi chefs at work and learn how we put together our great tasting, fresh sushi plates. Of course, he enjoyed sampling a variety of our best sushi and got a chance to chat with owner, Gene Nakanishi. We know we impressed with our fresh ingredients and traditional sushi-making method that gives our food its rich, fresh flavor and beautiful presentation. When it was all put together, here’s what the Food Network had to say about Osaka. 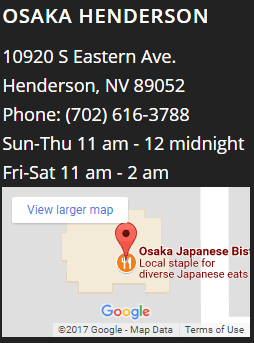 The Original Las Vegas Japanese Restaurant – and Still the Best! Why has the food at Osaka Japanese Bistro won the prestigious Asahi Shukan award for being one of the 50 best Japanese Restaurants in the world? Because of our history of excellence. Osaka was founded by the Nakanishi family in 1967 and quickly became a favorite among visitors and entertainment elite throughout the city. Everyone from tourists to the Rat Pack flocked here for the best sushi in Las Vegas. Nearly 50 years later, it remains family-owned and operated and continues to give guests the same complex flavors and amazing dining experience. Delight your palate at Osaka with three distinctive and delicious forms of Japanese cooking. Our menu offers a little bit of everything Japanese, and we’re glad to work around any dietary restrictions you may have. One ingredient we are passionate about is using the freshest, highest quality fish available, arriving daily and expertly trimmed and sliced by our award-winning sushi chefs. The best and freshest fish are at the heart of the delicate and delicious selection of flavors on our sushi menu. For a tasty and filling meal in a hurry, visit our sushi bar. We use only the finest fresh and seasonal ingredients to create a unique array of sushi dishes. If you’re new to sushi or not sure what you like, try our sushi sampler. This variety plate gives you a taste of four different rolls so you’re sure to find the one you love. If you’re a sushi afficionado, you’ll find a huge selection of traditional sashimi and sushi rolls, and some of our own creation, like our signature Pocket Aces roll (spicy crab, avocado, cream cheese and crunch, topped with salmon and fried onion and drizzled with Teriyaki, tataki and yumyum sauce). 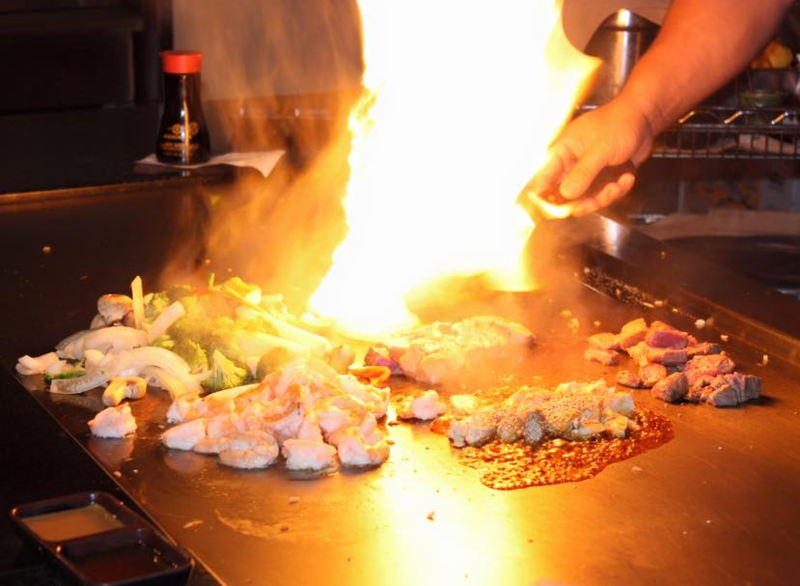 For an exciting night out with friends, you can’t beat our teppan grill. This fun indulgence allows you to watch your food being prepared and interact with the chef and other guests, enjoying the sights, sounds and smells as your meal takes shape. You can order surf and turf options including New York Strip topped with tiger shrimp. If you want to splurge on an iconic signature dish from Japan, don’t miss our kobe beef fillet. Any foodie can tell you that what’s on the plate is only part of the complete dining experience. Interact with friends and our friendly, efficient sushi chefs at our lively sushi bar. Your orders are prepared on the spot with flair and good spirit. Or, in Osaka’s tatami room, guests are treated to an authentic Japanese atmosphere as they savor world class, traditional flavors. Enjoy a quieter, more relaxed meal in your tatami booth along with plenty of attention from our knowledgeable servers. We offer a number of hot and cold appetizers and a wide range of authentic Japanese salads. These include surprising combinations of flavors and textures such as cucumber and wakame, sliced mountain potatoes, and spinach topped with bonito flakes. For your main course, indulge in mouthwatering dishes like our hearty rice bowls, vegetable omelettes, or chicken, beef, or pork entrees. For a real treat, try one of Osaka’s Special Boats, which include a number of tempura and teriyaki dishes served with delicious sauces and sides. 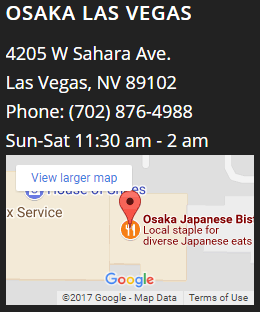 We think the Food Network would agree, if you haven’t visited Osaka Japanese Bistro, you don’t really know Las Vegas.